I want the Speedy 35 (maybe 30 if 35 seems too big) sans shoulder strap so bad! How do I get over this craving and move on to something more practical to purchase -- like a dining room table... or a refrigerator... or a fence -- when all I can think about is how cute this Speedy would look on my arm? Ugh! Then surprisingly we walked by LV store and he's like have you ever considered one of those? I said haven't thought much about it cuz ice always like coach. But the one you post above is super cute!! 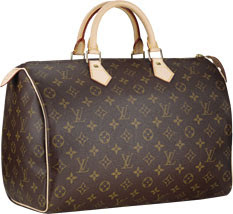 You like LV? hahahaa! I bought that a couple of months ago when I was supposed to be saving for our new furniture. It was waaay worth it :) Hubby might not think so...but I do!! I say get it!! hahah i have this problem too! sometimes we just need to get our priorities straight :( unfortunately i'm horrible at this. Bah, what a dilemma! So often when I reflect on what I spend on clothes, etc I think to myself "I could have bought all this ________ with that money!" I think I'm the only girl NOT crazed about Louis V bags...I think that bag is HUGE LOL I hate carrying a heavy purse shopping let alone anywhere. But that's just me..to each their own PS pics of your new home are Fabulous Dah-ling!